It takes a lot of skill to make a movie look easy, and when Billy Wilder’s at his best, his films can appear almost effortless, moving forward so naturally that I’m often surprised, and a bit disappointed, when they’re over. One stunning example of his prowess in that regard is Witness for the Prosecution, the 1957 film he adapted (with Larry Marcus and Harry Kumitz) and directed, from an original short story and play by mystery master Agatha Christie. The theatrical origins of the story really highlight Wilder’s skill in crafting the narrative through dialogue, character actions, and camera work, as well as showing off some incredible performances from a great cast. Charles Laughton plays Sir Wilfrid Robarts, a barrister begrudgingly allowed to return to work after suffering a “teeny-weeny” heart attack—so termed by his doting, nervous nurse, Miss Plimsoll (Elsa Lanchester, Laughton’s real-life wife). Though he’s warned to stay away from high-pressure criminal cases, one drops into his lap in the form of Leonard Vole (Tyrone Power, in his final film role). Leonard, accompanied by his solicitor, has been accused of murdering Mrs. Emily French (Norma Varden), a lonely widow who’d grown very fond of him—to the point that she’d amended her will to leave him a nice £80,000 chunk. A mound of other circumstantial evidence points to Leonard’s guilt, but he desperately proclaims his innocence, despite the fact that the only person who can confirm his alibi is his loving wife—who’s not exactly an impartial witness. But Wilfrid is intrigued by the case, and accepts the job, partly to escape the overbearing grip of Miss Plimsoll for a short time, but also because it seems evident that this type of work is truly what he loves to do. 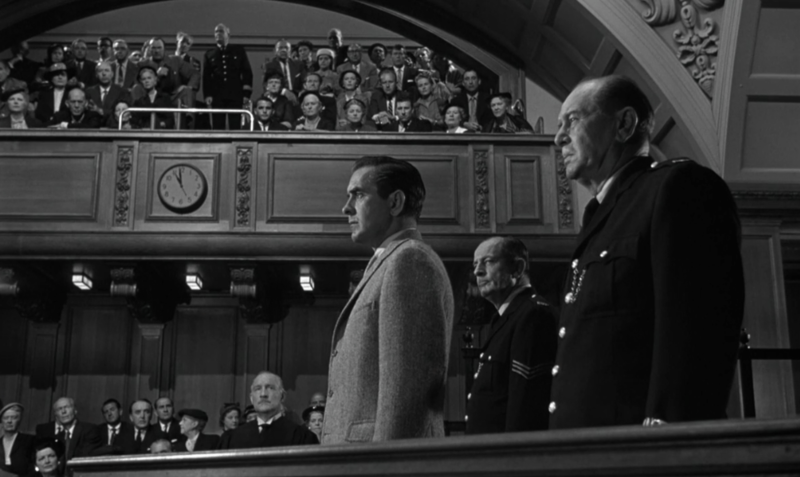 This film version of Witness for the Prosecution shares the simple structure of the play, with most of the scenes taking place either in Wilfrid’s office or in the courtroom. 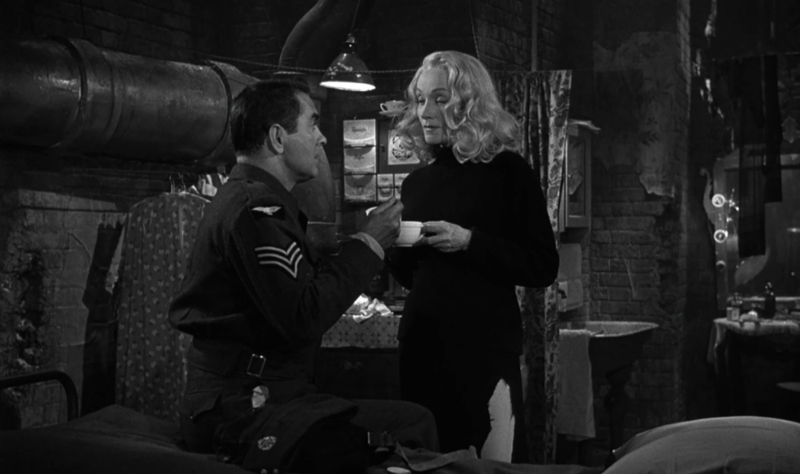 Flashback scenes enhance the texture of the narrative, helping—and sometimes misleading—the audience in visualizing certain vital scenes, such as seeing how Leonard met Emily (meet-cute outside a hat store) or how he wooed his wife (in a German nightclub during the war). But for the most part, we are limited to the dialogue and characters’ actions to communicate the story. That simplicity strips away many of the trappings that a novice director or writers might rely upon, but the Marcus-Kumitz-Wilder script keeps things moving nicely, exposition almost invisible at times, but always entertaining. The first 40 minutes are particularly exceptional to this end, having to explain all the facts of the case and introduce the major players while taking place, more or less, in a single location. And yet, it never feels clunky or expositional. One clever sleight of hand is to keep Wilfrid’s focus, and thus the audience’s, on a more straightforward desire: acquiring cigars, which his doctor has banned. Wilfrid’s constant swindling of the other characters to get the cigars and disposing of the remains with the practiced evidence-hiding skills of a criminal himself, while maintaining only a casual attention to the actual facts of the case, keeps the audience engaged and amused. Like a magician, Wilder asks us to keep our eye on the cigars, while the real story is going on in the background. Wilder also uses the camera to keep things interesting, and the stair lift that’s been installed in Wilfrid’s home takes particular significance, moving him in and out of frame at the appropriate moments. Though most screenwriting tips will tell you to “start late, and get out early,” Wilder almost gleefully disobeys that tenet by frequently having Wilfrid begin to exit a scene, only to scoot back in to deal with something else. I won’t mention the end of the film in any specifics, especially given the special post-conclusion voiceover asking viewers to “not divulge, to anyone, the secret of the ending.” If you haven’t seen the film, this should give you a good sense of the fireworks of the final 10 minutes; I’d have been satisfied with a single twist, but here you get about seven in the same time span. It’s an incredibly fun reward after the turns of the movie, especially as we’re kept at a distance from the inner workings of most of the characters’ heads for most of the movie; here, everything lets loose at once and all is explained. 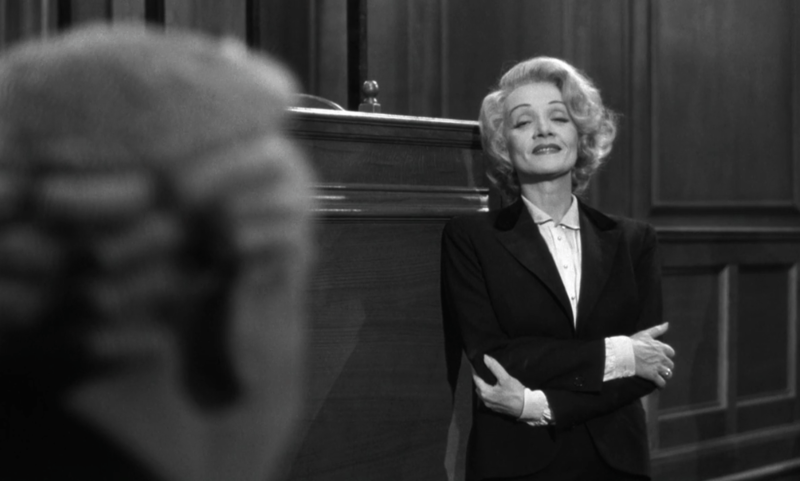 Witness for the Prosecution is a fantastic and fun example of Wilder’s skill, constantly and effortlessly shifting the audience’s perception of the characters—and even their grasp of understanding of the plot—with a flick of the pen. It’s a simple picture, but not simplistic… as many of Wilder’s best are. This post is a part of Once Upon a Screen and Outspoken & Freckled‘s Billy Wilder Blogathon! Check out the rest of the entries here. WOW, Emily! You review the heck outta this fantastic movie! LOVE, LOVE how you describe Wilder’s magic machinations throughout, how he manipulates us so that we see what he wants but never lose focus on a clearly narrated story. Add to that the terrific cast and this is one for the record books. Terrific read. A huge THANK YOU for taking part in the blogathon. Good review, I agree wholeheartedly. Personally, I think Power and Dietrich both look too old for the characters they are playing, but their star power and charisma allowed me to overlook that. Laughton, unsurprisingly, is the heart and soul of the picture. SPOILER! Don’t read the rest if you have never seen this movie! Is anyone ever fooled as to who the woman is who gives Laughton the crucial evidence that puts doubt in the jury’s minds? Not her finest moment as an actress, by any means. Did Wilder want us to guess at this point? Is Laughton supposed to guess, too, but ignore it since it aids his client? I think not, judging from his reactions when the duplicity is revealed. I like Marlene Dietrich in this, although I do agree she seemed a little old for the role. This always feels like quintessential Wilder – a delicate balance of humour, intrigue and melodrama. All the components that made Wilder great! I recently watched the remake of this with Beau Bridges and Diana Rigg among others, and despite almost using the same shots blow by blow, it’s far more meek and uninteresting. It really makes you appreciate how wonderful Wilder is because the movie still works even when you know the twists and turns. For me, Witness for the Prosecution is a lot like Sunset Boulevard: a mixture of drama and comedy. Laughton’s interactions with his nurse (and real-life wife) are priceless. And, as you noted, Dietrich does an exceptional job whenever she’s onscreen. I saw this movie right before turning 17 (really, it was two days befeore my birthday) and I was left speechless. I never forgot the many twists, and there is no doubt all the people involved had to sign a clause saying they wouldn’t spoil the end! Wilder is really a genius, only he could adapt Agatha Christie’s work with such a good taste (and good cast).